The Sacrifice of the Mass is the source and summit of the Catholic faith. Daily Mass is the gift of hearing the words of the Gospel, reflecting on the homily, and the joy of receiving Jesus in the Eucharist. Daily Mass is a wonderful way to start your day. Praising God first thing in the morning is important. Receiving Christ in the Blessed Eucharist strengthens us for the daily journey. The Mass is an ongoing spiritual formation which brings us closer to God. What is the role of the Daily Mass Ministry? Daily Mass is a ministry. 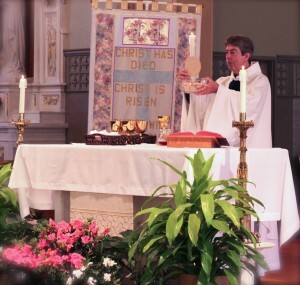 Volunteers who prepare the church for the celebration of the Mass serve the daily Mass ministry. Daily Mass Ministry volunteers unlock the church and prepare for Mass, setting the altar with the vessels for bread, wine and water. The volunteers in the Daily Mass Ministry serve as Eucharistic Ministers and Lectors for Mass, except during Mass with the school children, the teachers serve as Eucharistic Ministers and the children serve as Lectors and bring up the Gifts. The Rosary, led by the volunteers is recited after Mass. After Mass, the vessels are purified and the church is locked. I want to start my day with Mass!